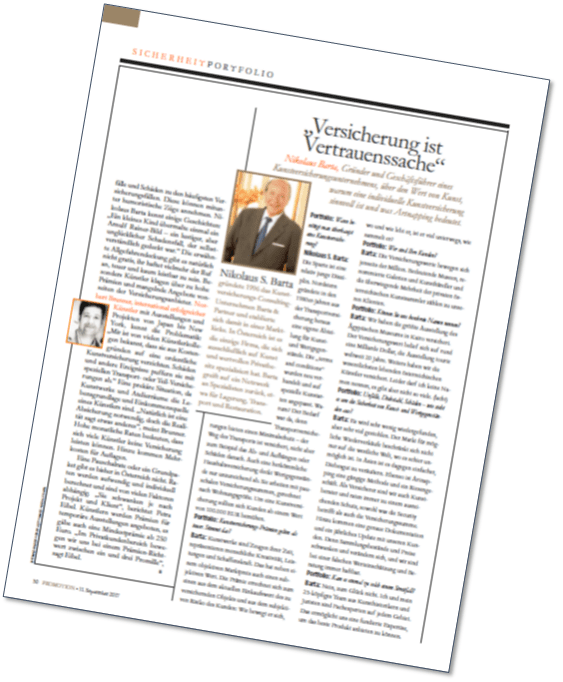 Nikolaus S. Barta founded art insurance-consulting-company Barta & Partner in 1996, filling a gap in the market. In Austria it is the only company exclusively specialised in art and private ownership. He has a network of specialists in areas such as storage, transport and restauration. Nikolaus Barta, founder and chief executive of an art insurance company, on the value of art, why individual art insurance is sensible and what artnapping is. Portfolio: When is art insurance needed? Nikolaus S. Barta: It is a relatively new line in the insurance field. In the 1980s Nordstern founded its own art and valuables division out of that of transport insurance. The terms and conditions were newly negotiated and adjusted to specific types of art. Why? The need arose because transport insurance offered minimal protection – damage occurred during the transport journey would be covered, but not, for example, when taking the art down, hanging it up or thereafter. Under conventional home insurance, valuables are also insufficiently covered. They work with fixed rate insurance sums, calculated according to property size. Clients should endeavour to insure art with a value of €100,000+. Portfolio: Art insurance premiums are said to be expensive. Is this true? Barta: Works of art are a testimony of their time, representing human creativity and accomplishment. They have an objective market price as well as a subjective value. The premiums are calculated on the one hand from the current purchase value of the object to be insured and from the subjective risk of the customers. How do they move, where and how do they live, do they often travel and how do they collect? Portfolio: Who are your clients? Barta: Insurance values exceed the million Euro mark. Among our clients are prominent museums, prestigious galleries and art dealers and the overwhelming majority of private Austrian art collectors. Portfolio: Are you able to mention any names? Barta: We insured the largest exhibition of the Egyptian Museum in Cairo. The insurance value amounted to around a billion Dollars and the exhibition toured the globe for 20 years. Furthermore, we have insured the most significant living Austrian artists. Unfortunately I cannot name any names, but there are not so many (laughs). Portfolio: Accidents, theft, damage – tell us more about the safety of art and valuables. Barta: Very little is recovered, but much is stolen. The market for possible resale is restricted not only in the West, where it is almost impossible. In Asia on the other hand, it is easier to sell stolen goods. Similarly, artnapping is a common method and a huge business. As insurers we are also art advisors and always commend sufficient protection, of both security and the insurance sum. Additionally our clients receive detailed documentation and a yearly update as collections and prices fluctuate and change, and we are always liable for incorrect valuation or consulting. Portfolio: Has there ever been a dispute? Barta: No, luckily not. I and my 25-person team of art historians and lawyers are experts in every field. This makes for profound expertise in being able to offer the best product.